Runewriters: 4.29 - What're You Reading? 4.29 - What're You Reading? And as always, you can vote for a little extra doodle! This one is about things Tareth's book might've been inspired by. 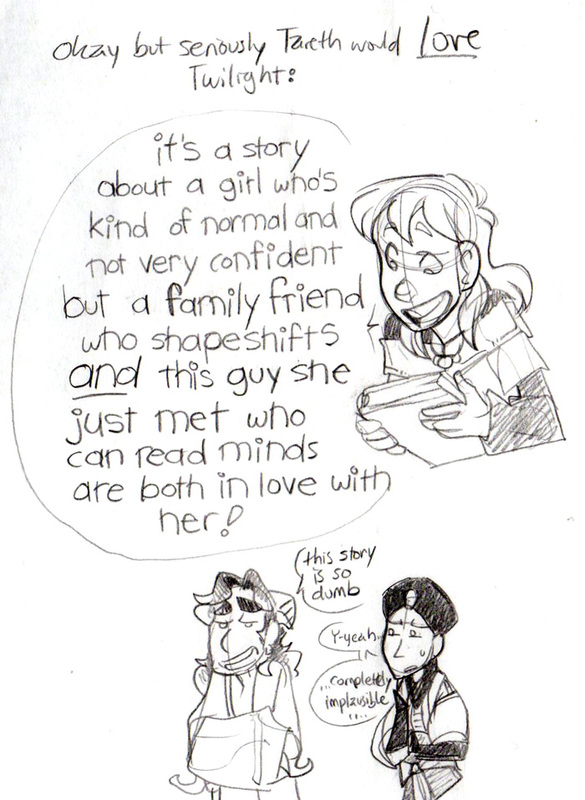 ARE YOU IMPLYING SEV AND XIRA ARE BOTH IN LOVE WITH TARRI. 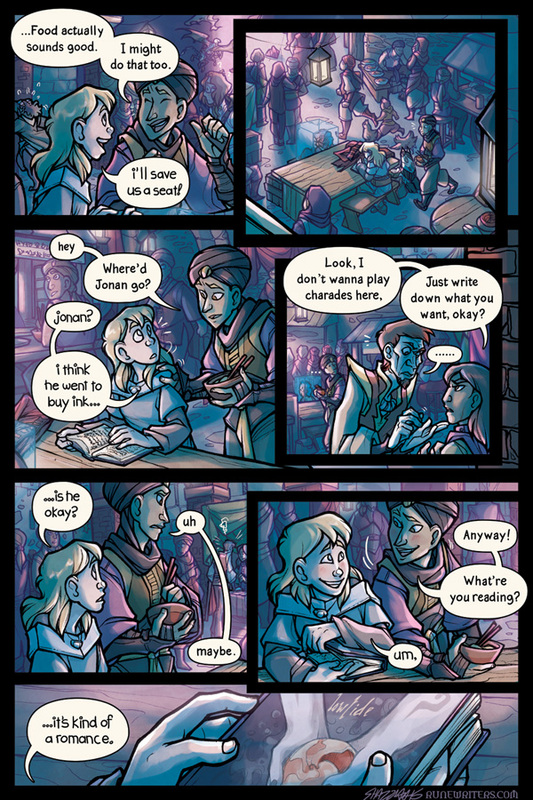 And now I can't help but notice Xira's blush in the second-to-last panel (Tarri's might just be because the book is romance). Eeeeeeeeeeeeeeeeeeeeeeew nope nope nope did not need that idea in my head NOPE. Shazzbaa, please never say anything remotely close to that statement ever again. Low Tide... so is this Like Twilight But With Merfolk? IT DEFINITELY EXISTS xD there were a whole bunch of mermaid books in the Supernatural Teen Romance section of our local bookstore a few years ago. I almost choked on my sandwich laughing when I got to the last panel! OH MY GOSH THAT IS PERFECT!! Luckily Xira is both a smoochable magical boy AND a huge earnest dork who expected all the rest of them to buy a room without him and was legitimately apologetic when Sev chewed him out for invading her space to try and help clear a spider web, SO. Just saying, Tari can have all the forbidden-magic romance she wants without Sev having to murder anyone for kidnapping her to the sea or stalking her while she sleeps! Everyone wins??? Everyone else is commenting on the last couple of panels, but I'm stuck on panel four. Someone go help Jonan please! That's got to be so frustrating. Tarith I no longer trust your taste in literature. Maybe not. There HAS to be better books on the subject, there HAS to be. D'aww their cute little blushes! Also, another reason why Tareth might be interested in the Twilight books- as a person with sucky hearing, I found myself a tad mesmerised by all the extensive descriptions of the stuff people could hear in those books. It goes on about their super-hearing a lot.